When you Play Cricket / Foot ball, you have to follow the rules assign to that game. Intraday traders have to follow some important rules of intraday trading to make profits. 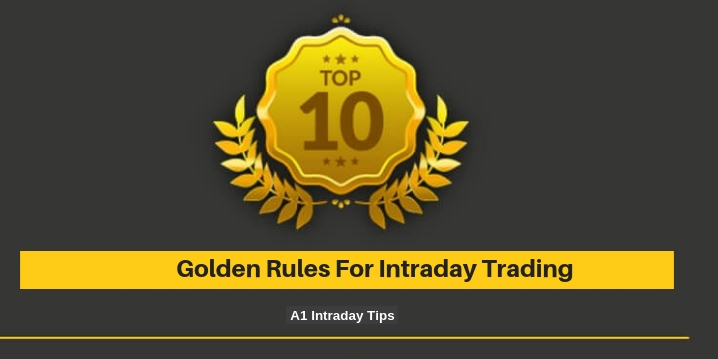 Our Professional expert advice, New traders as well as professional traders to follow the below mention top 10 golden rules of Intraday Trading to avoid losses as well has made smart money in Indian share market. Whenever you do intraday trading, always decide a stop loss and target for that Day trade. Don’t change that stop loss during the day. If Stop loss triggers, exit from your positions and get ready for new trade as advise by our experts. Keeps a positive attitude in Intraday trading. Always be positive while trading in stock market. Stock Market can go up and come down at any time. It may remain volatile all over the day. Always try to learn from your losses and also your profits that you get doing intraday trading. Our technical experts advise you to think what went wrong that day or what went right, and try to avoid mistakes that you may have done again. Trade with Market Trend if market is falling, sell first and buy later. Always keep Daily Profit and Loss Target as per your risk appetite. Exit all positions after once your targets are reached. Some traders keep profits target of 10,000 a day or a risky trader can keep a target of 1,00,000/-. Same way some Day traders keep Loss target of 2500 or 10,000/-. Once this is breached we advised you to square off your positions and close your trading software. Don’t be Greedy, Keep Booking your Profits at regular intervals. Always trade in limits, don’t take excessive margins by calling brokers or depositing extra money during the day. Over trading is dangerous weapon of self destruction. You should always Keep your emergency money safe, don’t risk your emergency money in share market. As if you lose your hard earned emergency money, your life with your family can be in problem in critical circumstances when money is required to pay medicinal bills. Wining and Losing is the part of the Day trading; one can’t always make profits in in Day trading in stock market. If you make loss in trading, accept it and forget the monetary loss. You have to stop thinking about the losses but you have to always remember the trading strategy that went wrong on that day. Keep your mental emotions at a side while doing intraday trading, trade with brains not by your heart. We have always seen, if trading is done by heart, if will always be on a losing side. A1 Intraday Tips give two days free trial on your mobile by sms. Take our free trial and check our past performance report.